Lettuce in the EAA showing the debilitating symptoms of fusarium wilt. Lettuce is an extremely important crop in the Everglades Agricultural Area (EAA), and now it is facing a new disease. 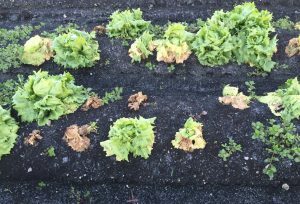 Richard Raid, associate center director and professor of plant pathology at the Everglades Research and Education Center (EREC), says he has been working in the EAA for 30 years and this is the first instance of fusarium to appear in lettuce. According to Raid, samples of diseased lettuce were brought into the EREC in 2016. These were the first plants he had seen infected with the disease. “When we looked at those plants and dissected those plants, we could see vascular discoloration that’s symptomatic of many fusarium diseases,” Raid explains. Fusarium wilt impacts a few different crops in Florida, such as tomatoes and cucurbits. However, fusarium wilt on lettuce is a relatively new phenomenon in the United States. Raid says the disease first appeared in California and then in Arizona. So how did the disease arrive in Florida? Raid suspects fusarium spread through infected seeds, as this disease has done in the past. According to Raid, the first recognizable symptom of fusarium wilt is the stunting of plants. Stunting can be seen in early stages of the plant’s life, even as a seedling. “You’ll recognize that some plants are much smaller than plants that are adjacent to them,” Raid says. Following the stunting, infected plants will start to yellow on some of the lower leaves. As the disease progresses, those leaves will start to turn brown and then wilt away. Raid says fusarium diseases are difficult to control using chemicals. “There are a few things that have shown some significance in terms of control, but nothing of the type and level of control you need,” he says. Raid says EAA growers should follow cultural practices such as crop rotation and flooding. Flooding is a popular tool in the EAA to manage problems like nematodes and other fungal diseases. However, Raid says he is currently unaware of the impacts of flooding for fusarium wilt management. “One thing I stress to growers is, oftentimes the best time to manage a disease is before you even put a plant in the ground,” Raid says. He believes the best way to manage this disease will be to breed a future variety of lettuce that is resistant to fusarium wilt.